Sedaselfarm is recommended in case of psycho-emotional loads, disturbances of sleep, as an additional source of a complex of biologically active substances of plant origin. Valerian root, Melissa, peppermint, motherwort. Valeriana officinalis is the most popular medicinal plant with expressed sedative effect, which has been used for nervous breakdowns, difficulties with falling asleep, neurogenic pains in the gastrointestinal tract from the days of yore. 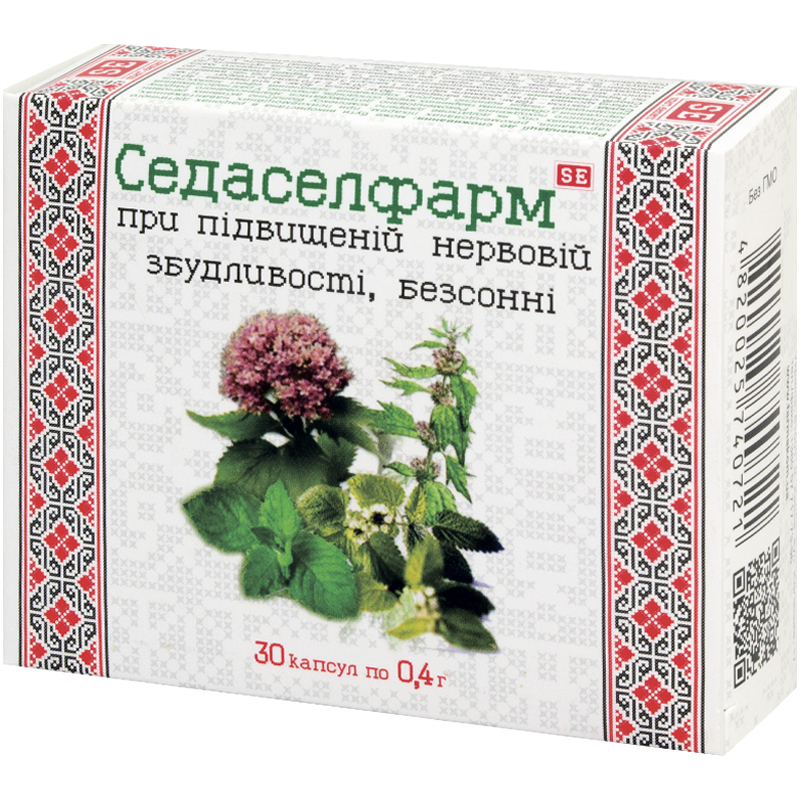 Melissa officinalis is an effective painkilling medicinal herb for relieving neuralgias and headaches; it has been used in case of nervous breakdowns, depression and disturbances of sleep, as well as to cope with increased psycho-emotional and physical loads. Motherwort (leonurus) reduces excitability of the central nervous system, provides spasmolytic effect; it has sedative, hypotensive, cardiokinetic properties. Peppermint is a medicinal plant, having spasmolytic, vasodilating effects, improves digestion; it provides choleretic effect; in folk medicine it is used to treat cardiovascular, pulmonary diseases, as a sedative in case of nervous diseases, as a conditioning agent in case of lack of energy. Adults take 1 capsule thrice a day with food for one month, further the term of use is to be agreed with a doctor. Proteins – 0.82 g, carbohydrates – 48.37 g, fats – 0.17 g.